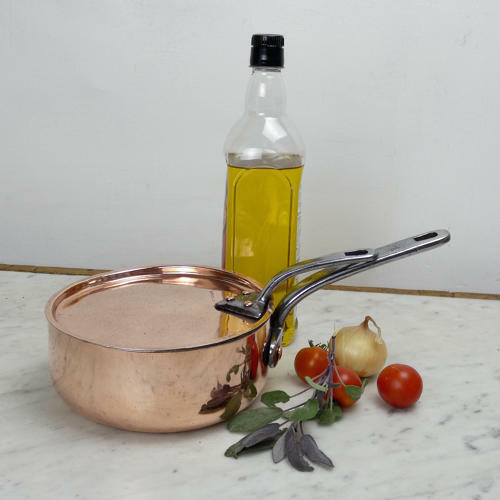 An English copper, deep saute pan and cover with steel handles. The lid of this piece is marked 'HARRODS LTD' and it dates from c.1890. Harrods were the retailers and the pan was probably made by Jones Brothers although it is not marked as such. This shape was typically produced by them. It is well made, from a very heavy gauge of copper, and it is in very good condition. There is just very slight denting to the lid and someone has scratched a number into it. The interior has been re-tinned so that the piece can be used. Size: Diameter of pan18.2cm Depth of pan 7.8cm Overall length of pan and handle 34cm.